We have developed a system which enables near perfect synchronization of high-speed video footage for observation of events happening at pico second speed. 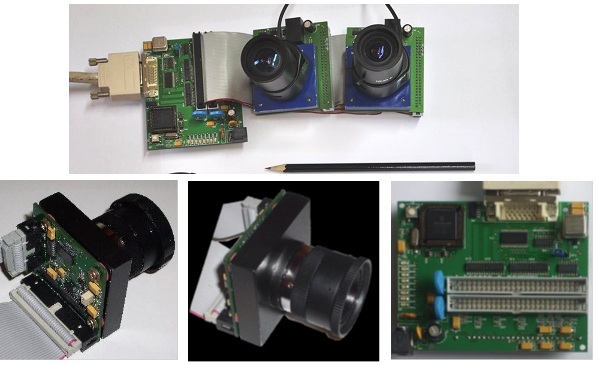 The system inherently synchronises high-speed, digital, independent cameras with exceptional accuracy by (a) making use of image sensors which have been manufactured under identical conditions and (b) dispensing with all but one clock signal. The system is compatible with the industry standard Camera Link® for data transfer. The proposed application area is High Speed Industrial Multi-Vision. A second prototype is in the process of being developed with more up to date hardware. Patent granted. A patent was filed in Malta in September 2008. This was extended to a PCT application which has been granted in the U.S. (no. US865425) and Japan (no. JP5512683). The EP application is still in the National Phase (no. EP2332339). We are looking for collaborators to produce the final version of the product. We are also interested in hearing from researchers who would like to test the system on for their specific application. Azzopardi, M.A., Grech, I. & Leconte, J. 2010, "High Speed Tri-Vision System For Automotive Applications", European Transport Research Review, Springer Verlag, Berlin/Heidelberg, vol. 2, no. 1, pp. 31-51. Azzopardi, M.A. 2009, "Towards Camera-Link as an Automotive Video Bus: Enabling High Speed, Synchronised, Multivision Systems for Automotive Applications", Proceedings of The BMVA Symposium on Vision for Automotive Applications,British Machine Vision Association (BMVA), London, UK, May 20th. Azzopardi, M.A. 2008, "Camera-Link and Synchronism in Automotive Multi-Vision Systems", Proceedings of the 4th International Conference on Automotive Technologies (ICAT2008), ICAT, Istanbul, Turkey, Nov 13-14, pp. 344.